Over the last ten years, Apple has built over 350 Apple Stores worldwide, so an Apple enthusiast named Thomas Park decided to put up a large gallery of every single one of the stores. In the gallery, Park has collected a picture of nearly every Apple Store in existence and assembled them all on one scrollable website. 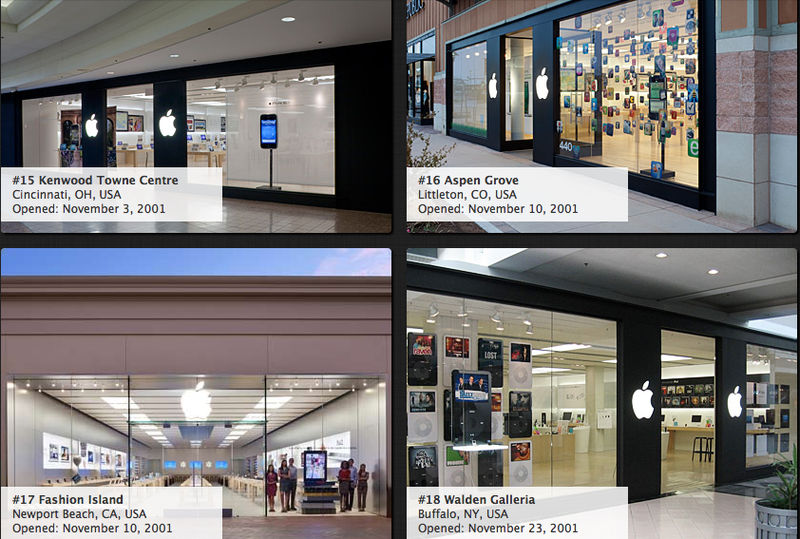 His catalogue shows the evolution of Apple’s retail designs throughout the past ten years, beginning with the first Apple Store in Tyson’s Corner, Virginia in August 2001. At the time, most analysts considered Apple’s fledgling retail initiative to be doomed. But though Tysons Corner seemed like a modest start, it was a blueprint for big things to come. 357 stores and counting later, Apple is tops in sales per square foot, and they did it by applying many of the same principles as they do to their products: natural materials, understated aesthetics, and daringly innovative processes. Anyway, one thing I wanted to do was go back and see how Apple storefronts have evolved over the past decade. I couldn’t find anywhere to do this easily, so I decided to create a gallery myself. Visit Park’s website to view this awesome gallery.